There are sufficient videos, food television that shows you how to make a dish but there is nothing like getting down and doing it yourself. Do you know what finished pasta should feel like? Learning how by just touching a steak to know if it is well done or rare? How should I be holding my knife? Can you chiffonade and dice to proper size? Is that pie crust too dry? What are the techniques in making a proper dark roux? I am a strong advocate of hands-on cooking classes, there is nothing like jumping right in and learning techniques. 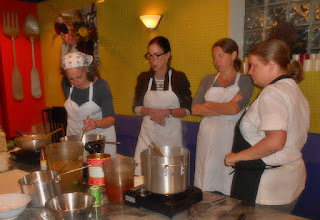 My first hands-on cooking class was well over 30 years ago or more with the lovely French instructor Germain Sharretts at the Church of the Redeemer. I learned a lot in the class. We would break up in teams and prepare a 3 course meal. It was there that I learned how finished pasta should feel, the proper rising of the baba rhum dough and making a proper pâte à choux.